Morning all well today is another bright and sunny day and it really makes you feel like Spring is on its way. 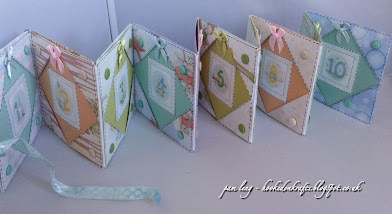 Today my sneek peek is from the second Rachelle Ann Miller CD Rom from Crafters Companion which launches on Friday 7th March on Create and Craft. This is a brand new section on the CD of Alphabets and Numbers so I thought it would be a lovely idea to make a numbers book to give to a small child, the papers are so beautiful on this CD it was so hard chossing which ones. Absolutely stunning Pam, you make the most beautiful creations.